Black and white is a pairing as old as time. These sharply contrasting shades add the perfect amount of chic to any room, whether used as a focal point or an accessory. Here are some classic ways to incorporate this winning combination in every room of your home. Wallpaper is a great way to reinvent a room, and an even better way to show off your interior design skills. Today’s trendy patterns combine black, white and geometric. Sharp angles and lines are the perfect solution for a space in need of a face-lift. Accessorize your newly graphic room with glossy finishes and metallic trinkets for a contemporary look. Pillows and blankets and linens — oh my! Scared of commitment? Try on this stark style by adding throw pillows and comfy accents to a black or white outfitted bed for an instant style boost. Mix large patterned pillows with solid-colored lumbar sizes to create contrast. Pile on textured throws in black and white (or both) for a voluminous take on the classic combo. Round out the look with pieces of abstract art in shades of gray and a bedside lamp or two in your favorite metallic tone. We’ve all seen white walls, but what about black accent walls? Though it is a little intimidating at first, a black wall adds just the right amount of contemporary contrast when you’re not sure how to go about painting your room. Whether you like semi-gloss or super matte, a black accent wall is great for rooms with lots of natural light and plush furniture for some added edginess. Hang statement artwork on the wall or layer on interesting sconces for an eclectic twist. 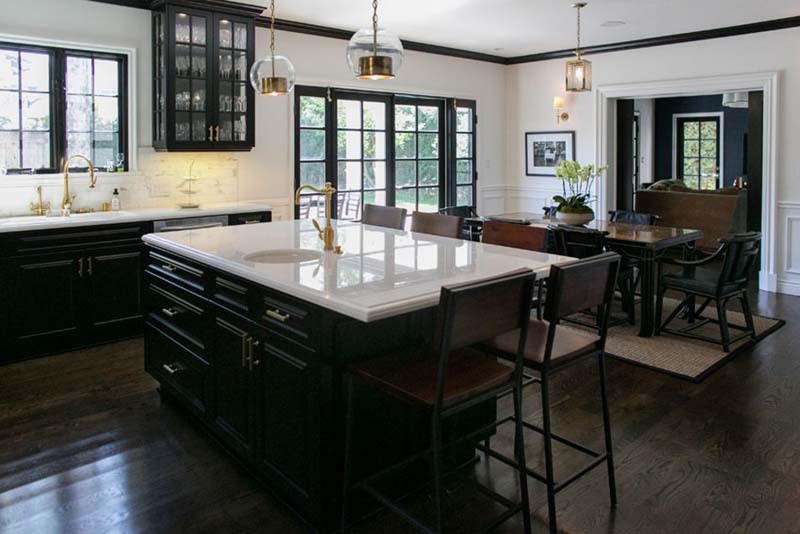 For a classically styled black and white room, start with the kitchen. Because black and white is so crisp and clean, it’s the perfect spot to test out this smooth style. Alternate the colors between different areas of the kitchen — a black range, white cabinetry, black countertop, white backsplash—and you’ll find that you didn’t even notice you had only used two colors. The alternating shades add depth and dimension throughout the space without adding too much color. Keep it clean with chrome or gold-toned faucets and hardware, and add freshness with colored glass accessories. Courtesy of 24 Design Construction. 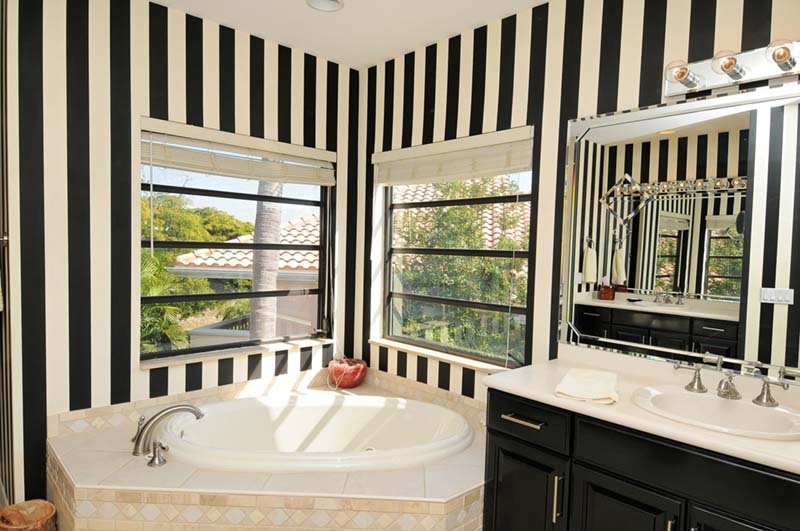 While the bathroom is often one of the last places to get any attention for its decor, it might be the first place you want to try the black and white trend. 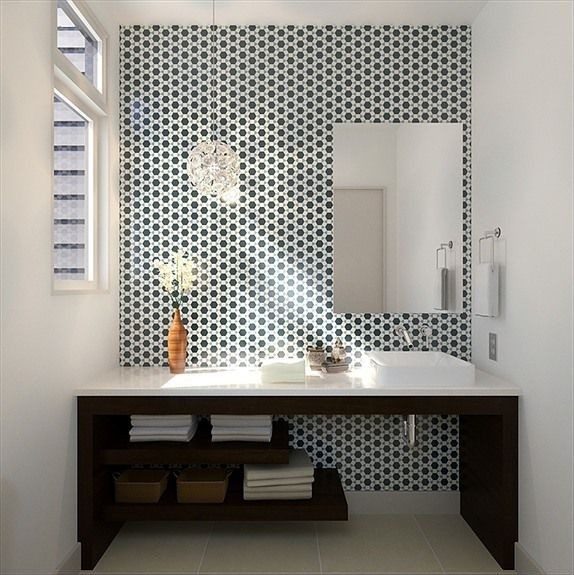 Black and white alternating tiles add texture and dimension to an accent wall. Mix cool, dark cabinetry with shimmering light fixtures for extra glamour. Keep the rest of the room simple and serene by adding an unfussy floral arrangement and plush linens, and you’ll find that the bathroom might just be your favorite room in the house. 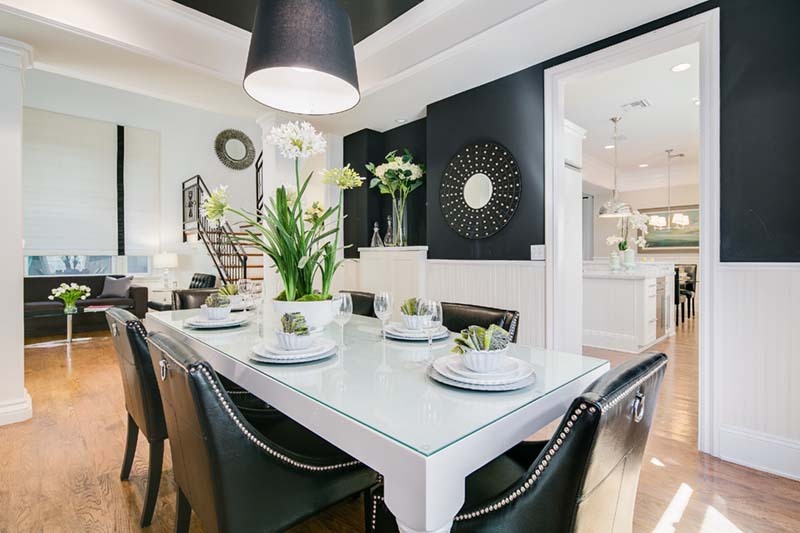 It doesn’t matter if your style is cool and contemporary or totally traditional, combining black and white paint, accents, and furniture is an easy to way to boost any room in your home, while adding sleek simplicity.